A new podcast from Capital Public Radio reporter Ezra David Romero is digging into stories about Yosemite National Park. 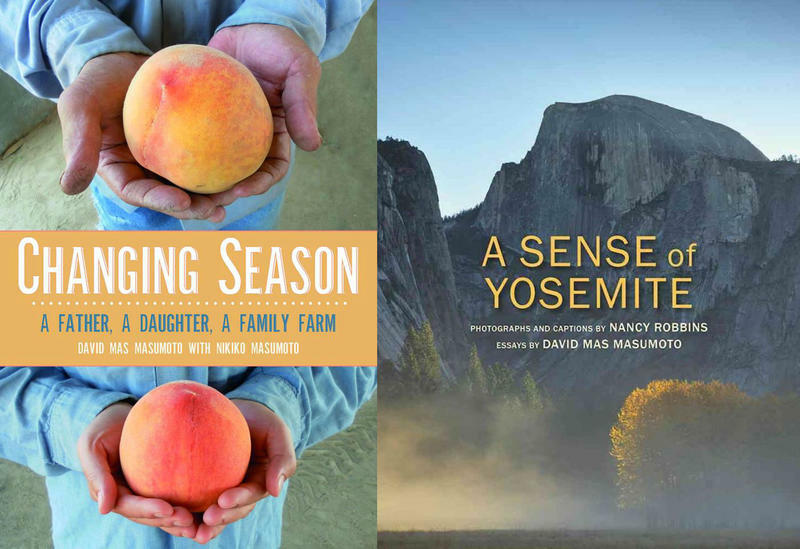 Called Yosemiteland, the limited-run series explores everything from commercialization to climate change. A new episode also deals with how the park is dealing with wildfire. That's of special concern now as most of the park is closed to the public due to impacts from the Ferguson Fire. The National Park Service has backed off its plan to raise entrance fees at popular parks like Yosemite, Sequoia and Kings Canyon to $70. Under a revised plan announced Thursday, the new entrance fee would be $35.00 starting June 1. The park service says the majority of the increased revenue will stay in the parks to help on a backlog of maintenance. Overall, across all parks, entrance fees rise $5 under the new plan. 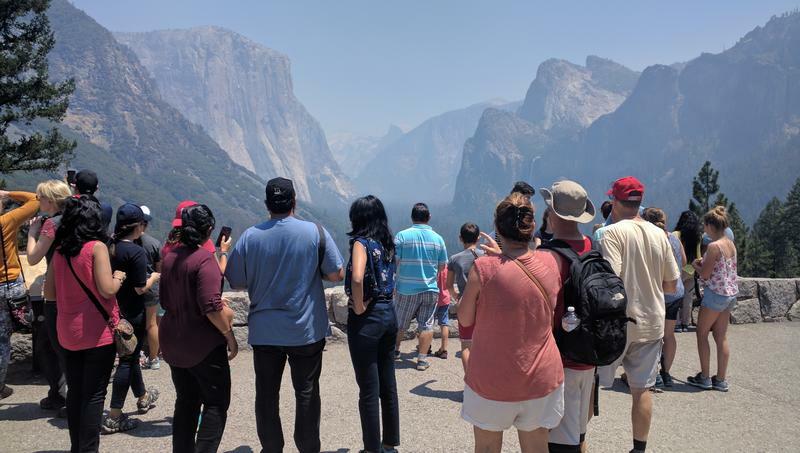 A new proposal from the National Park Service would result in a big hike in Yosemite National Park entrance fees during the popular summer months. Under the proposal, which also applies to 16 other parks including Sequoia & Kings Canyon, the entrance fee between May first and September 30 would be $70 per vehicle, $50 per motorcycle, and $30 per person. The funds would be used to improve facilities, infrastructure, and visitor services, with an emphasis on deferred maintenance projects. With fires burning across California devastating entire communities, homeowners are beginning to file claims with their insurance companies. But in the mountains of eastern Madera County, many homeowners say they’re losing their insurance during a time when they could need it most. Frank Ealand lives in an area near Coarsegold in the foothills of eastern Madera County that insurance companies call a fire prone zone. He says in the past three years his homes have gone without insurance after being dropped by companies three times. 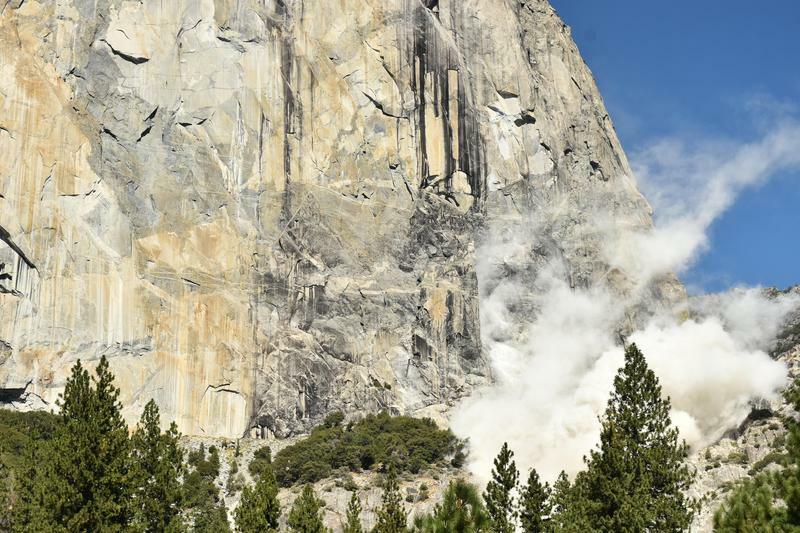 A second giant rockfall's been reported out of Yosemite National Park. Thursday afternoon, at around 3:20 p.m., a large portion of rock fell off of El Capitan, a giant rock formation in the park popular among rock climbers. Park officials say it was larger than Wednesday's slide and that one injured person was helicoptered out. Climbers who saw the fall say it was like watching a four story apartment building slide right off the mountain. The Detwiler Fire has now burned over 70,000 acres and is 10 percent contained, but officials say they are making progress in the firefight, and say Mariposa residents may soon be able to return to their homes. Ken Pimlott is the Director of Cal Fire. He says cooler temperatures have helped the effort. “Our goal is to the use the next several days while the weather has somewhat moderated to really try to get containment lines in, but we’re really not out of the woods,” says Pimlott. Overnight infrared imagery of the Detwiler Fire shows the blaze has grown to over 70,000 acres. The fire is now 10 percent contained. In the last 24 hours the southern flank of the fire was active, burning south of Highway 140, in the area between Mariposa and Cathey's Valley. Across the Merced River the northern flank of the fire also advanced and is threatening the community of Coulterville. It has destroyed 45 buildings and damaged six others. A visit to Yosemite National Park's Tuolumne Meadows is always special. But this winter's historic snowfall made for an especially memorable season for the two people who stayed behind when Tioga Road closed, and everyone else departed - Tuolumne Winter Rangers Laura and Rob Pilewski. This year they endured massive snowfall, the loss of electricity, and went two months without seeing another person. People love seeing black bears when they visit places like Yosemite National Park. They’re powerful creatures that can be docile or ferocious depending on the encounter. In such a highly visited place incidents with bears are bound to happen, and as FM89’s Ezra David Romero reports the park has come up with a new plan to keep bears and people safe. It’s Fresno State student Quiang Chang’s fifth time to Yosemite National Park. He and his friends are walking along the Lower Yosemite Falls Trail. He still hasn’t seen a bear yet, but if he does he says he has a plan. Wildfire season may be over in the Sierra Nevada, but there's one issue that is still burning white hot among those fight forest fires for the federal government. A recent article in the Washington Post documents a number of high profile claims of gender discrimination and sexual harassment among female firefighters with the U.S. Forest Service. Will A Roundabout Cure Traffic Problems In Yosemite Valley? This year Yosemite National Park is on pace to have four and a half million visitors. That would be an all-time record. All those people mean a lot of traffic in a place known for its serenity. And as FM89’s Ezra David Romero reports the Park Service is in the process of making changes so visitors won’t have to often wait in what feels like rush hour traffic in the middle of the forest. The year 2016 was supposed to be one of celebration at Yosemite National Park, one of the crown jewels of the now century-old National Park Service. But while President Obama did visit the park to celebrate the NPR Centennial this past summer, a new scandal has rocked the park and those who work there. Allegations of a hostile work environment, gender discrimination and sexual harassment led longtime park superintendent Don Neubacher to unexpectedly resign last week. 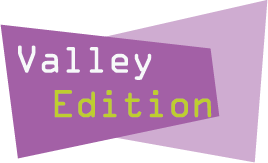 This week on Valley Edition Reporter Jeffrey Hess recounts the First Family's trip to Yosemite National Park. We also hear reporting from KVPR'S Ezra David Romero on how a sheep farmer is growing feed indoors to save water. Later in the program Capital Public Radio's Amy Quinton reports on groundwater issues in Paso Robles. FM89's Jeffrey Hess also reports on Laura's Law, the California state law that allows for court-ordered assisted outpatient treatment. Ending the program we hear from Agustín Lira And Patricia Wells about their new album 'Songs Of Hope And Struggle." President Barack Obama and the first family visited Yosemite national park over the weekend to commemorate the 100th anniversary of the National Park Service. The Obamas took in the sights of the popular park as part of a two-day stay, including hiking to Glacier Point. 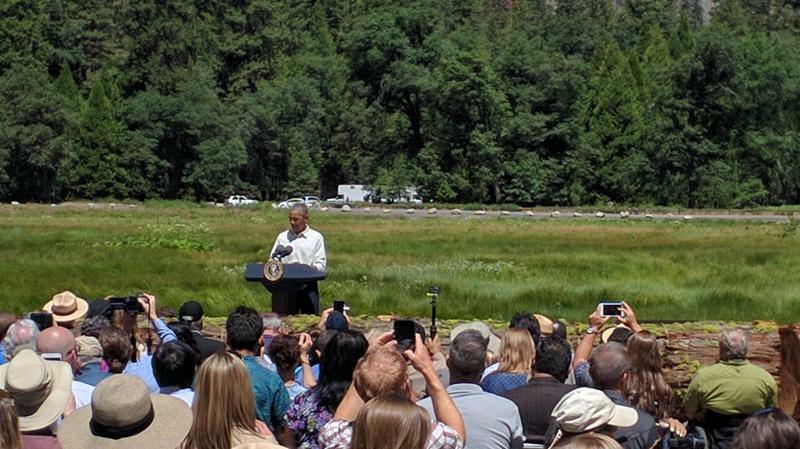 Obama himself gave a short speech in front of the Yosemite Falls saying preserving the national parks for future generations is a huge task. Last month National Park Service officials made headlines when they announced their plan to remove the historic names from many of Yosemite National Park's treasured amenities, like the Ahwahnee Hotel and Curry Village, it sparked a public outcry. Some popular Yosemite landmarks including the Ahwahnee Hotel and Curry Village will soon be getting new names thank to a lawsuit over intellectual property associate with the park. Longtime concessionaire Deleware North contends that it owns the trademark to the names, and wants $50 million from the new concessionaire Aramark, which takes over March 1st. The National Park Service disputes the trademark claims. 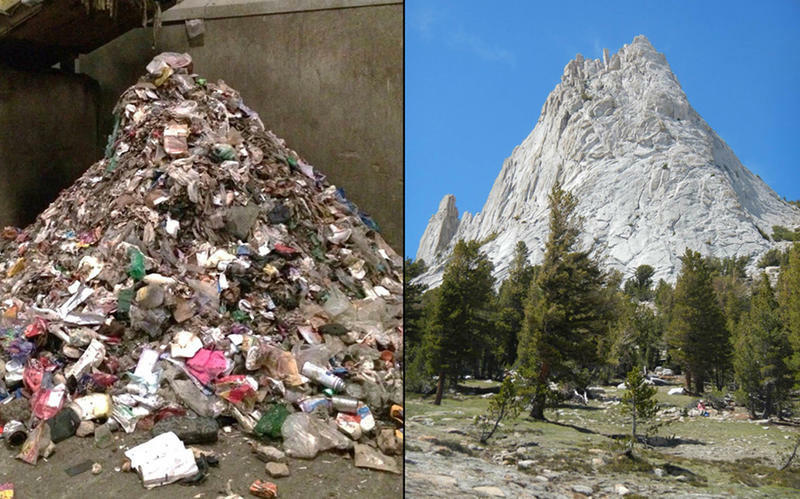 Scott Gediman is the Yosemite spokesperson. A rockfall early this morning below the Arch Rock entrance to Yosemite National Park has closed Highway 140. Massive boulders are currently blocking the roadway, which is near the site of the 2014 Dog Rock Fire. The road is currently closed from the park entrance to the junction of Highways 120 and 140. It's unknown when the roadway will re-open. Services in El Portal are still open. 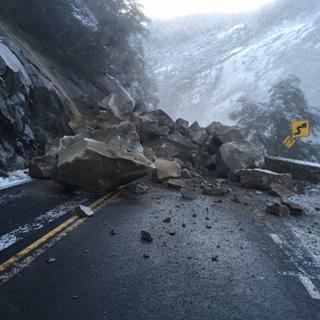 The rockfall happened at about 5:45 A.M. Thursday morning, following several wet El Nino storms.